As business grows and network expands, more and more users and devices as well as new applications like cloud-based services would join the network. It means that high network availability for sustainable business, more workplace Wi-Fi and up-to-date regulations for application usages are eagerly needed. Without an effective solution to control, optimize or block social and some other Web applications, businesses would risk not only losing productivity but also exposing company network to new threats. 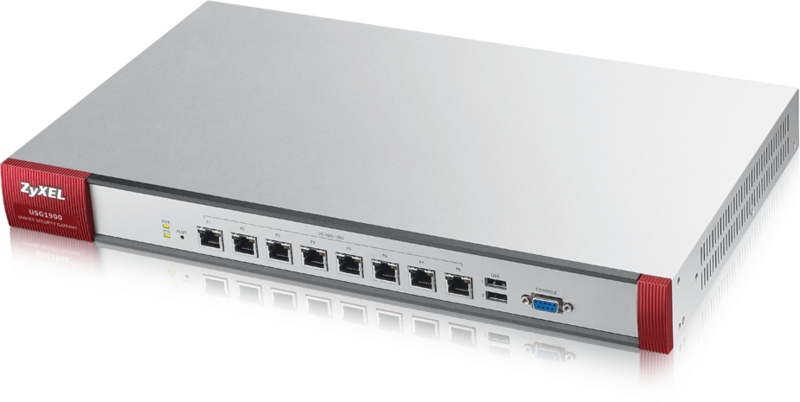 The new Zyxel USG Extreme Series are Next Generation Firewalls (NGFW) designed to deliver high availability, anti-malware protection and consolidated policy enforcement for medium-to large-sized businesses and campuses. The Zyxel USGs provides WAN and VPN load balancing and failover ensures nonstop business communications, while incorporating bestin-breed anti-virus, anti-spam, content filtering and application intelligence technology for effective application optimization and comprehensive network protection. Zyxel’s USG Extreme Series is built on a powerful multi-core platform to deliver high performance that helps growing businesses to overcome challenges during the expansion. In order to satisfy the needs for always-online communications, the Series features multi-WAN load balancing/failover and a comprehensive mobile broadband USB modem support list for WAN backup operations. In addition, the Series supports IPSec load balancing and failover to provide additional resiliency for the most missioncritical VPN deployments. 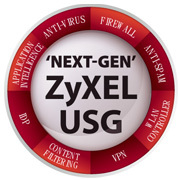 The Zyxel USG Extreme Series provides extensive anti-malware protection and effective control of Web applications—like Facebook, Google Apps and Netflix—with industry-leading firewall, anti-virus, anti-spam, content filtering, IDP and application intelligence. These security measures are enhanced with SSL inspection, which helps block threats that are hidden in SSL encrypted connections and facilitates deeper policy enforcement. 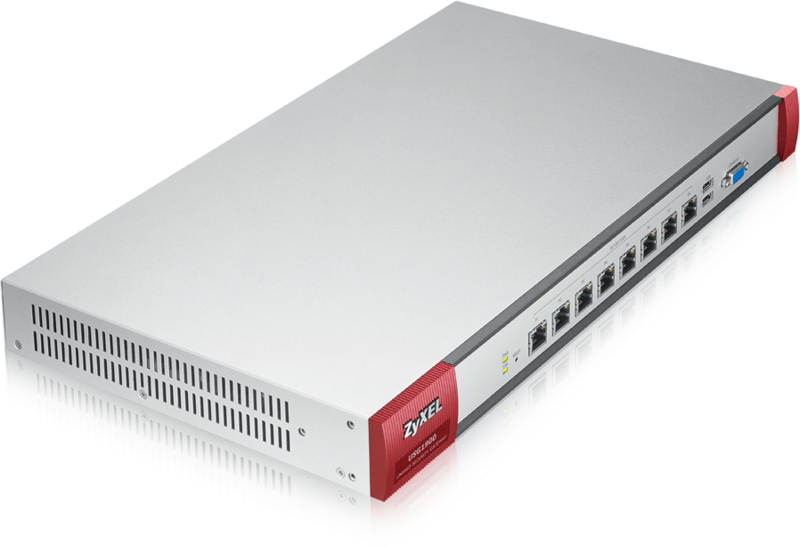 The Zyxel USG Advanced Series provides non-stop Internet uptime with multi-WAN and mobile broadband support. Multi-WAN works with two or more Ethernet WAN connections for active-active WAN load balancing or active-passive failover. Comprehensive mobile broadband USB modems are also supported for WAN backup. 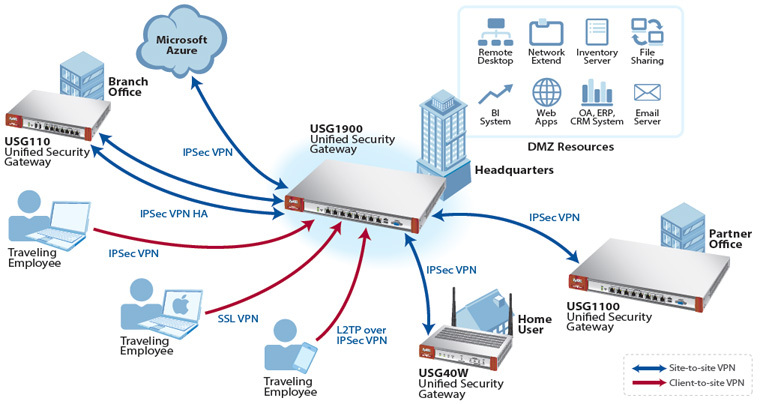 Zyxel USGs feature VPN HA to satisfy the demands of the most mission-critical VPN deployments. Supporting advanced GRE over IPSec technology, users can deploy two IPSec VPN tunnels for active-active VPN load balancing or active-passive failover. With a cloud-based IP reputation system, Zyxel anti-spam can deliver accurate, zero-hour spam outbreak protection by analyzing up-to-the-minute sender reputation data from highly diverse traffic sources. It can detect spam outbreaks in the first few minutes of emergence regardless of spam language or format. The integrated WLAN controller supports CAPWAP, and enables centralized authentication and access management of multiple APs in the network. The Zyxel USG Advanced Series can manage 2 APs by default, and up to 18 APs with license upgrade. Zyxel’s USG Advanced Series can identify, categorize and control over 3,000 social, gaming, productivity, and other Web applications and behaviors. Users can prioritize productive applications, throttle acceptable ones, and block unproductive applications to boost productivity and prevent bandwidth abuse. SSL inspection enables the Zyxel Advanced Series to provide not only comprehensive security, but also deeper policy enforcement. It enables the USG’s application intelligence, IDP, content filtering and anti-virus to inspect traffic in SSL encrypted connections and block threats that usually go unseen. *4: AV and IDP throughput measured using the industry standard HTTP performance test (1,460-byte HTTP packets). Testing done with multiple flows. *5: Maximum sessions measured using the industry standard IXIA IxLoad testing tool. 6: Product availability varies by country and region. Please contact local sales team regarding availability in your region. Download the Zyxel ZyWALL Next Generation USG Series Datasheet (PDF).